The casino game Craps is a popular dice game where you simply bet on what the outcome will be of the roll of a pair of dice. Craps can be divided into two categories, namely ‘street Craps’, where players play against each other, and ‘casino Craps’, which mean playing against a bank. 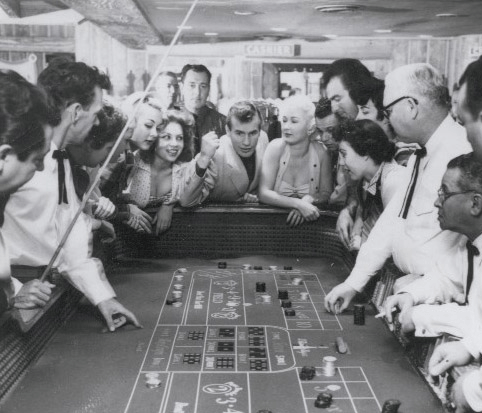 The stories about how Craps first was created are many and vary a bit from time to time. But what is generally known when tracking it back in history is that Craps first came as a development from the English game “hazard”, created by an English noble called Sir William of Tyre. The game became a huge social event and was rapidly spread in luxurious gambling spaces. It is called Craps because of the influence of the French, where the translation of hazard is “crabs”, which is where the name allegedly comes from. The first version created was in this case street Craps, which came from the time when people used to play by rolling a dice against a curb or a stair stoop by the choice of the player and without a backstop. Hazard, or Craps as it was called by then, first came to America through the French that brought it with them to their colony in French Louisiana. In turn, the first version of the modern Craps was developed in New Orleans by a colonial landowner, called Bernard de Mandeville. He was both a gambler and a politician who thought of simplifying Hazard. However, improvements needed to be done in his version on the use of fixed dices. The casino was very vulnerable to exploitation by the players when using fixed dices. Therefore, an American called John H. Winn came up with the different betting options as a solution to the problem, and this version is the one actually used today. The solutions included that one bets “right” or “wrong”, as well as “Don’t Pass” bets. He also changed the layout of game, which is the one still used today. In this form, the fixed dice lost its beneficial power and in turn this grew to one of the most popular betting games in the world. It made its way all the way to Mississippi primarily and later into different casinos and gambling places all over the U.S.
Today, the Craps played in land-based casinos is still said to be the official form of the game. Nevertheless, the online version has become one of the most famous gambling games as well. It has been present online for more than 15 years and is now also available on smartphones in a mobile version. The online version, including computers, tablets and smartphones, constantly develops in regards to graphics and gameplay. Online craps include both the street Craps and casino Craps in a brilliant manner. Here, the game is overly simplified though, by the basic reason that it can get too complicated online. It also allows for all players to try and enjoy the game instead of just the ones with an already big interest for the game.